Spinal stenosis in the neck is the second most common anatomical location to experience central canal and neuroforaminal narrowing. The neck is an area which must endure constant movement, as well as the considerable force applied to the region due to the heft of the cranium. The cervical spine is noted as an area which suffers considerable degeneration as part of its normal lifespan, so it is no surprise that cervical spinal stenosis is an expected aspect of getting older. In fact, it is rare for elder people not to demonstrate at least some degree of central canal stenosis in the middle to lower cervical regions. This narrative explores the facts and myths of cervical spinal stenosis. 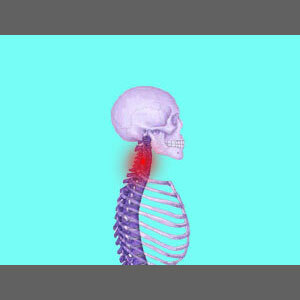 The neck can be the worst possible region to suffer symptomatic spinal stenosis. This is because the higher a canal narrowing condition exists in the vertebral column, the wider ranging and more serious its effects may be. Fortunately, most cervical central canal and foraminal space narrowing conditions are not symptomatic or only mildly symptomatic. Remember that mild to moderate stenotic changes anywhere in the spine are highly unlikely to be the actual root source of pain or related neurological symptoms. For patients who do show advanced or extreme stenosis in the cervical spine, the symptoms may be significant and highly affective. Pain, tingling, weakness and/or numbness may exist anywhere in the neck, body or even legs due to a cervical stenosis issue in the central canal. Symptoms may exist in the neck, shoulder, arms, hands or fingers from a foraminal stenosis or lateral recess stenosis condition in the neck. Cervical stenosis often causes widespread symptomatic patterns and may cause certain distinctive and serious expressions, such as falling, the inability to stand for long or walk for long, incontinence, balance disorders or complete physical impairment. These effects may exist along with pain, but may also be present when no pain is experienced. We routinely receive letters from patients who have lower body issues like tripping and sciatica, but have clear lumbar MRI studies. We always advise them to undergo testing of the cervical spine, and in many cases, this discloses a causative stenosis issue in the neck. Remember to consider this possibility if your symptoms match this particular scenario and no structural issues have been deemed causative in your lower back. Both bone-related and soft tissue-related stenosis are both common in the neck, since osteoarthritic change is universal past middle age and disc herniations and disc desiccation are also virtually universal past age 30. MRI testing is best to diagnosis spinal stenosis of any type in the neck, since it can visualize all the possible causes and contributors, while x-rays can only see bone-related changes. If you have been diagnosed with spinal stenosis in the cervical spine, remember to see a qualified neurologist for symptomatic correlation and treatment advice. Trusting your primary care to any other type of doctor or complementary caregiver might be risky and is not advised.